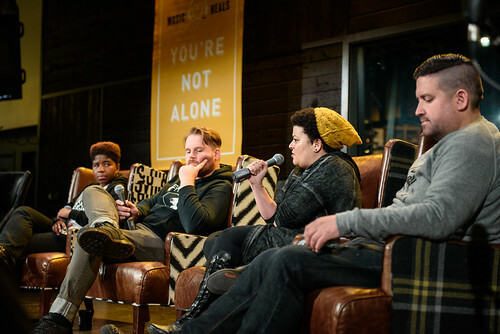 KEXP, Upstream Music Fest + Summit, MoPOP, and The Recording Academy have partnered together to present Mastering The Hustle: a new panel discussion with six annual events, tackling a different topic to help emerging artists make better decisions earlier in their careers. Throughout the series, we’ll be discussing everything from how to get airplay, legal and licensing, healthcare for artists, and promoting your brand. In 2017, musicians have more tools than ever to promote their releases and upcoming performances. But just because these resources exist doesn’t mean it’s always clear on how to best use them to get results. Being a successful musician, whether locally or internationally, means knowing the ins-and-outs of getting your music into the ears of the people who it will best connect with. From social media to press releases, how do you get your music from Pro Tools on your home computer to local stages and featured on blogs? 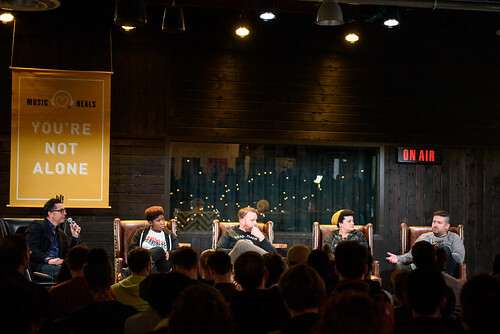 In the sixth installment of installment of the Mastering The Hustle workshop series, we invited a panel of Seattle promoters, bookers, and artists to share insights on how up-and-coming musicians can utilize new platforms to get their music out there and find their fans. 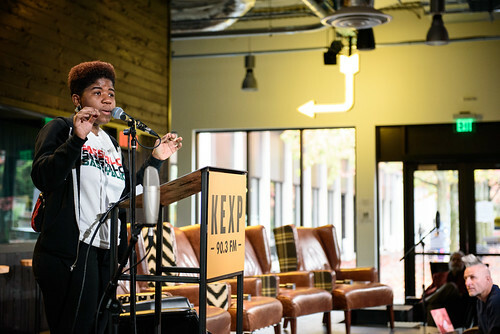 Seattle vocalist and producer Sassyblack, Sub Pop’s Manager of Social Media Content + Strategy Rachel White, BuildStrong Music and Do206’s Austin Santiago, and SoundGig Presents’ C.J. 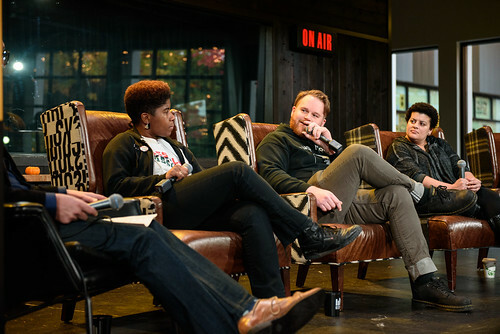 Frederick all discussed ways they’ve promoted themselves and other artists on a panel moderated by KEXP’s Greg Vandy, host of The Roadhouse. Sassyblack started the workshop with a lively keynote that highlighted the struggles of artists trying to build their audience and some pertinent tips on how to break that barrier. Sassy walked her talk throughout her presentation. As she mentioned artists selling merch to promote their work, she showed off her very own Sassyblack shirt that she was wearing underneath her sweater. Having lived in Seattle for 20 years and performing music professionally for 13 years, Sassy came with a wealth of knowledge of what works. After leading a rousing chant of “hey hey, I’m here, it’s okay,” she was off. And she was quick to deliver some strong truths about why promoting your music matters. She narrowed down an artist’s main recurring goals to three ideas: increasing your audience, selling merchandise, and book more gigs. Sassy currently books and manages herself, which she says is “awesome and super stressful.” She’d relate back to her earliest experiences and things that worked for her. Chief among her points was the idea of getting involved with the local music community. A great place to start, she says, is to attend open mic nights and jam sessions. She encourages artists to “come prepared with a song that you are comfortable with and sign-up to perform.” What’s great about this setting is that people are there with the intention of discovering new talent and meeting new artists. She also stressed the importance of attending local shows, not just playing them yourself. She added that this doesn’t just mean getting on the guest list for your friends show, but paying for tickets because you want people to pay for your shows too. It’s about fostering the community. Going to shows is also a great chance to meet people who are also working in your community. She suggests finding artists who are doing things that are appealing to you, whether that be in genre or the way the music is presented. There’s no need to “lie to kick it” and pretend you like someone’s music for the sake of networking. If someone’s art compels you, there’s your segue to start a conversation. Building those connections is crucial. It can lead to collaborations down the road which are mutually beneficial (she also exuded the value of doing a cover song to help bring in a wider audience). Beyond just postering, utilizing email and social media is crucial for artists. This would be a theme throughout the whole workshop, but Sassy got the conversation started by addressing the immense value of having a press release and mailing list. She made a point to stress that sliding into someone’s DMs or tweeting incessantly at music industry people and writers is not a good look and will have negative results. Implore traditional methods like an electronic press kit (EPK) that features your bio, photos, and links to your music. Create a mailing list of writers, bookers, and promoters so you can start reaching out to the people who can help get your music out there and take physical copies to your local record stores. After Sassyblack’s exhilarating keynote, the workshop moved into the panel discussion. Greg Vandy promoted the others with a hypothetical prompt about a 24-year-old introvert moving to the city, trying to navigate where to start. Austin Santiago was quick to weigh in, stressing some of the points that Sassy brought up earlier and expanding further. In his eyes, it’s important to first identify the people in your community who are making similar music. This is the best way to find people and music you can best relate to. It’s a natural fit to develop a friendship and you can eventually start sharing music and show bills together. Santiago also emphasized distribution as another major factor to consider. Whether you’re an introvert or not, making sure your music is on major platforms like iTunes and Spotify is crucial. He suggests finding a good distribution company, with endless options just a Google search away. Getting a manager to help connect you with the right industry people can be helpful, but not always easy to find. Santiago recommends a Facebook group called Artist Manager Connect, which features industry professional from across the world sharing tips and helping pair artists with managers who can help them reach their goals. C.J. Frederick’s advice for artists was cut-and-dry, saying, “Maybe it sounds over-simplified, but book your own show.” Having thrived in the DIY scene himself, promoting his first show out of a basement in Georgetown, he discussed how house shows and low-key events like these can be great for finding like-minded artists and greatly reduces the pressure of connecting with bookers and venues. Even when you are playing in “proper venues,” Sassy suggests checking out the venue beforehand and introduce yourself to the staff before you reach out about doing a show. Most people have accounts on social media platforms, at least for themselves. In your day-to-day life, social media is great for keeping in touch with friends and family. For artists, it’s a powerful tool that can help bridge gaps between you and your peers and audience. But it’s not an instantaneous thing. “You have to build your community in person before you can build your community on social media,” Rachel White said. Social media isn’t a way around making those in-person connections — it’s a supplement. White suggests looking at other musicians in your area and seeing who they’re following and find out where the community is congregating themselves on social media. For people who are introverted and feel uncomfortable about promoting themselves on social media, White suggests enlisting a friend who can do it for you. There’s no way around doing it, but it can help ease the burden. White says that artists need to be on the “big three” platforms: Facebook, Instagram, and Twitter. Facebook is the most used platform of them all, “so if you hate Facebook, you need to get over that,” White says. Even though each platform functions differently, White says there’s value in having consistency with your profile picture and header image on each account. It helps establish your brand for your audience. Facebook more and more is changing their algorithms and trying to get page admins to pay for promoting posts. While this can be valuable, White also recommends looking out for times of day that your followers are most active and engaging online. You need to post at least once a day and try to participate in conversations via hashtags and comments. White suggests putting some rules for yourself, specifically recommending creating posts that highlight “something old, something new, something borrowed, and something that’s just you.” Santiago echoes the last point, encouraging artists to find their voice and owning it. Some artists thrive better on different platforms. If you find that you love Twitter, embrace that. Just make sure you’re active on each network. It doesn’t mean taking yourself too seriously either. In fact, it’s quite the opposite. Infusing your personality into your posts is encouraged and can even help you succeed. White mentions Father John Misty doing particularly well at having a consistent and hilarious voice on Twitter. Sassy talked about an N*Sync beat tape she made earlier this year — something she wanted to do for fun just as a fan of the band, showcasing another side of her personality. After posting it on social and tagging the members of N*Sync, it was picked up by publications like Spin and even got retweeted by N*Sync’s Chris Kirkpatrick. Getting a write-up in a local or national publication can be a huge asset for artists trying to break out, but finding the means to getting coverage can be bewildering. Sassy was quick to weigh-in and mention again that creating a press release is a great place to start, but also added the need to do your research. Beyond just sending out your press release to whatever publications you can, spend some time learning about the writers and the types of music the publication and author are covering. Be intentional about who you reach out to. Find those writers who cover your type of music. She also recommends introducing yourself, whether you see them at shows or at panels at festivals. Santiago adds that it can be helpful to keep a list of people who’ve supported and written about you before. That way, the next time you have a release, you can reach out to people who have already shown interest in you. “Listening is the biggest thing you can do for yourself,” White says, referring to listening on social media. She recommends looking at who is writing the bylines of articles you like and taking a look at their social media, adding that artists should be respectful when engaging and following writers and others. Find common ground with writers and you can have positive interactions with one another. Don’t just comment, “hey you should check out my music.” This, White says, guarantees they won’t click on it.